Located away from the flurry of Station 1, behind local landmarks as Our Lady of the Most Holy Rosary Church and Balabag Plaza, Eco Hotel is a leisurely 5-minute walk from the stunning white sand beach. 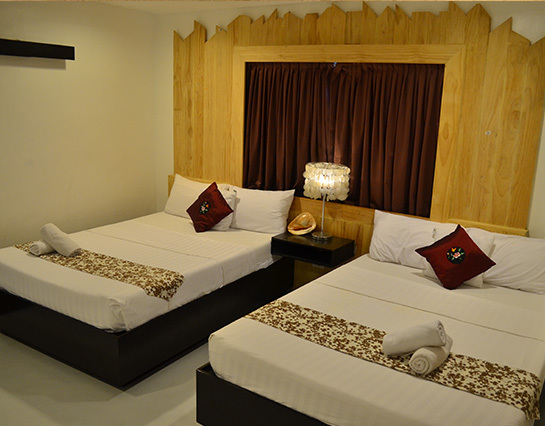 This eco-friendly hotel in Boracay is accessibly situated near restaurants, bars, stores, recreation and sports centers. Eco Hotel is a two-story structure that houses 4 standard rooms, 1 garden view room, both ideal for couples, and 2 family rooms for bigger groups. 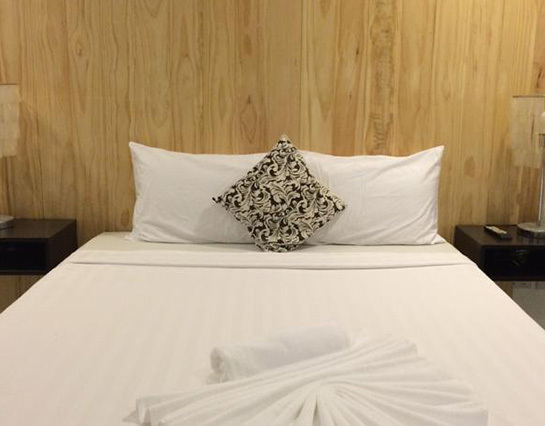 All rooms at our affordable Boracay Station 1 hotel are adorned with repurposed pine wood for headboards and window casings emitting a soothing scent of pine. Rooms are spaciously furnished with queen sized beds, high thread count linens, fluffy pillows, plush blankets, fresh towels and basic toiletries. 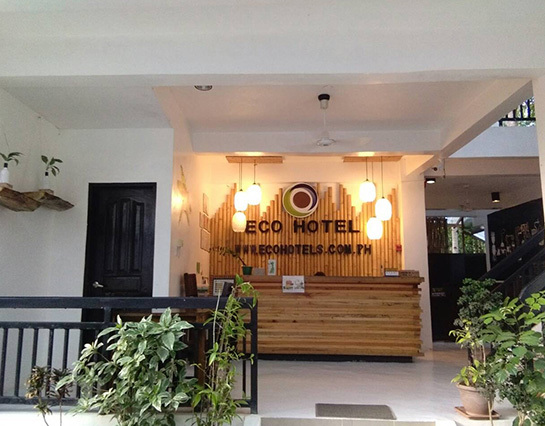 Furthermore, Eco Hotel Boracay is built with sustainability in mind. Every part of it has been meticulously planned, from the refurbished wood and light fixtures to the cork keys. In fact, our bedroom slippers are made from water lilies, crafted by the talented hands of Gulod Cabuyao Laguna Foundation. We also save on water and energy, and practice good waste management. We are not only an eco-friendly and budget-friendly accommodation in Boracay Station 1; we’re alsoa pet-friendly hotel and welcome furry pets up to 25 pounds, subject to a pet fee of P500 per pet per night. Our front office hours are from 7 AM to 10PM. A night duty security personnel ushers guests after. Next to our Front Office is our lounge where we serve an awakening cup of our signature – locally sourced – coffee (projectlocoph.com), and a choice of meal selections from our breakfast menu. Wi-Fi is available only at the lounge area but may be intermittent as is the case in the whole island. 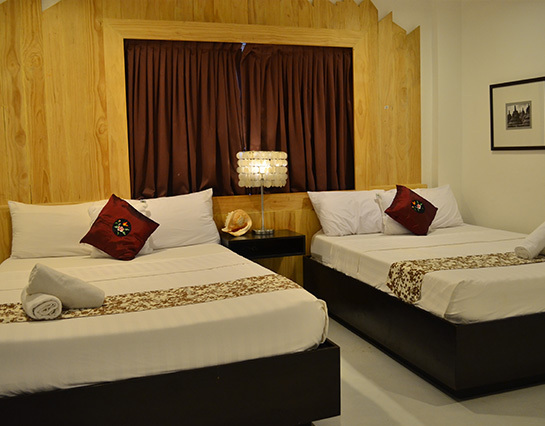 Book a room with Eco Hotel Boracay, today. Our standard rooms are intimately designed for couples wanting to spend time away from the stresses of the real world. The rooms offer a view of greenery, whether it be the manicured herb garden or the natural heath of the island. Blackout curtains are provided to aid in extended sleep should the nightlife get in the way of bedtime. Our Queen Garden View room, located at the 2nd floor, is spaciously configured to accommodate a couple while comfortably squeezing in a third person for an extra person charge. The window opens to a view of the lush green garden of Pops District. For the third person, the room is furnished with a sofa that can convert to a single bed. Additional linens, pillow and towel will be provided as part of the extra person charge. Our Family rooms are designed to accommodate 4 people while ensuring that enough space for movement is still available. Ideal for families or a group of friends appreciating togetherness in a common space.